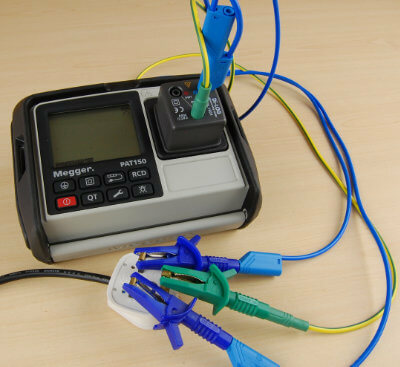 For PAT testing equipment that does not have a standard 13A BS1363 plug, an adaptor is required to connect the appliance to the PAT tester. 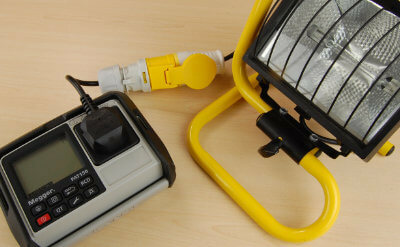 Once connected, the tests are carried out in the same way as any other 230V equipment. The most frequently found 230V connectors are IEC 60309 (CEE industrial connectors) and round pin BS 546. Although BS 546 connectors have largely been superseded by the standard 13A plug, they are still permitted for use and are generally used for lighting. 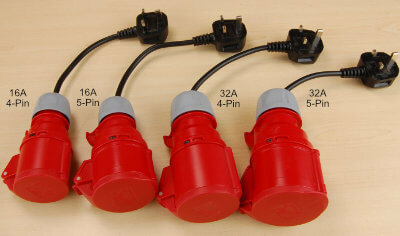 5A round pin plugs can often be found on lamps connected to switched lighting circuits. 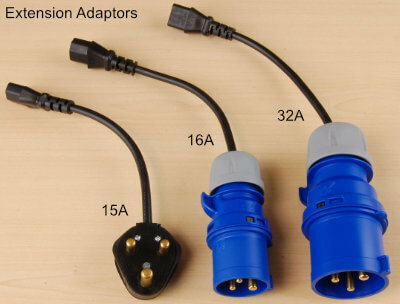 15A connectors are mostly used for dimmable circuits in stage lighting. IEC 60309 (CEE) Industrial plugs are used on a wide range of equipment. Typically industrial equipment that requires more than 13A, or protection from water ingress. These connectors are available in 16A, 32A, 63A and 125A ratings, but 16A and 32A are the most frequently used. 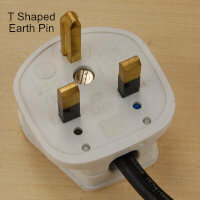 For testing extension leads, an extension adaptor is also required. This connects the trailing socket end of the extension back into the IEC socket on the PAT tester to allow an earth continuity and polarity test to be carried out. 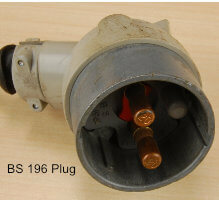 Another commonly used 230V adaptor is the C5 (cloverleaf). 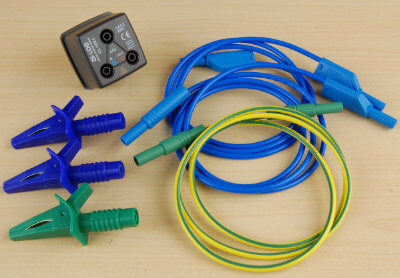 C5 IEC leads are typically found on IT equipment and require an adaptor to connect the cloverleaf style connector to the IEC socket on the PAT tester to carry out an earth continuity and polarity test. 110V is used on construction sites and for other high risk tools and equipment. 16A and 32A connectors are the most commonly used, although 63A & 125A sizes are also available. 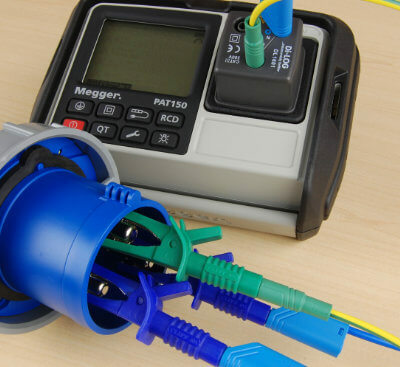 110V equipment can be connected to a PAT tester via an adaptor in the same way as 230V equipment, however a 230V leakage or load test should not be carried out as this will likely damage the equipment under test. 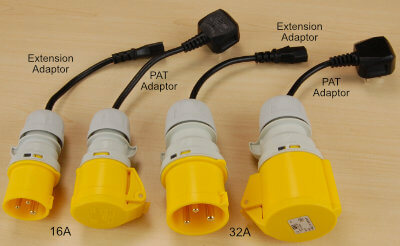 Extension adaptors can also be used for the earth continuity and polarity test on 110V extension leads. 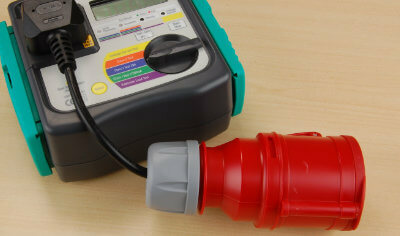 Some PAT testers, such as the Metrel BetaPat, have a built in 110V socket and do not require an adaptor to connect 110V equipment. 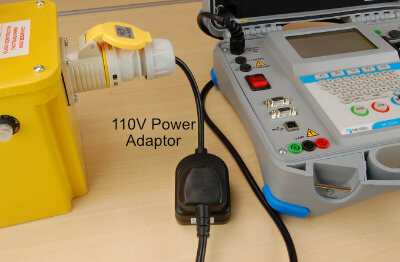 The BetaPat requires a 110V power adaptor to power up from a 110V supply and can perform a 110V leakage and load test. 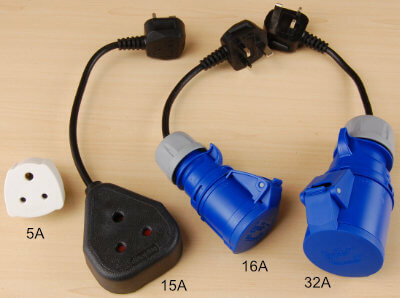 To connect a 32A 110V plug to the BetaPat, a 16A to 32A adaptor is required. 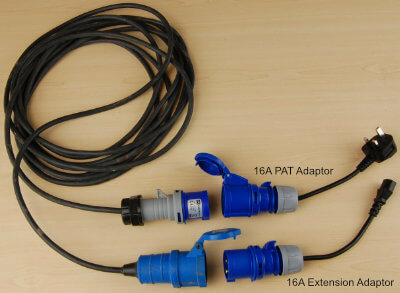 3-Phase equipment can also be tested using an adaptor. 3-Phase connectors are available in 4-pin and 5-pin variations, with 16A and 32A sizes the most commonly used, although again 63A and 125A are also available. 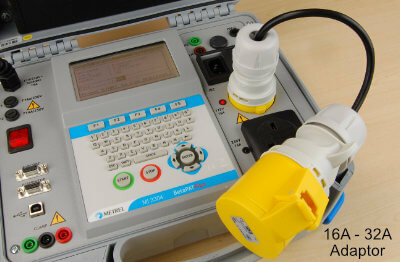 A PAT tester can only carry out an earth continuity and insulation test on 3-phase equipment. Generally extension adaptors are not used for extension leads as the PAT tester can not carry out a 3-phase polarity test. The earth continuity on an extension lead can be measured by connecting the test probe to the earth pin in the trailing socket. Unusual connectors are often found during PAT testing. For example, variations on the standard 13A plug are sometimes used to prevent the connection of unauthorised equipment in sensitive areas such as server rooms. BS 196 industrial connectors, although mostly superseded by CEE connectors, are still occasionally encountered whilst PAT testing. One method of testing equipment if you do not have a suitable adaptor, is to use a break-out socket adaptor and test leads. When using this method, I would advise not to carry out a leakage or load test at 230V as the pins are exposed. For added safety in this example, only the Neutral and Earth connectors are used. This will allow an earth continuity and insulation test to be safely carried out.